Feedstock is homogenized in the mixing unit and automatically pumped into our highly optimized medium-loading rate, continuous flow anaerobic biodigestors. 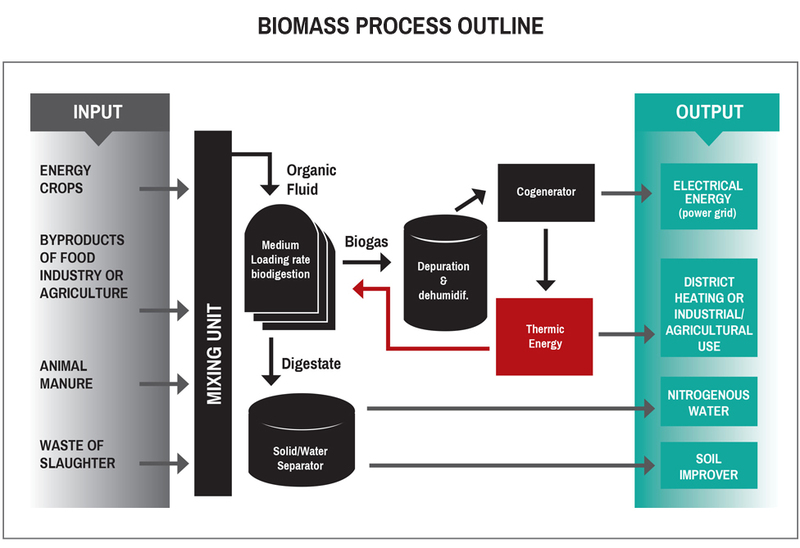 The entire biodigestion process is software controlled, and specially designed to maintain the quality of the organic material and ensure ideal gas production. Stainless steel biodigestors to avoid common structural problems with traditional cement containers. Special design of biodigestor enhances surface contact with bacteria and prevents against material compression. Elevated mixture of biomass with external circulation pump and horizontally inclined agitator. Hydrolysis section within the system to pre-digest materials from different origins. External access points for easy maintenance and servicing. Gasometer to ensure sufficient and continuous flow of biogas to cogenerator engines. High biogas production thanks to high efficiency biodigestion process. Low energy consumption systems, with capacity to run on half of energy produced (via cogeneration). Modular design makes system easy to scale to project size. Software controlled systems reduces operation & maintenance costs. A typical plant processing up to 22.000 tons/year of corn silage biomass requires a capital expenditure of 5 – 5.5 million euro depending on location, local construction costs, fees and permits. Based on current Italian tariffs and fees, a plant of this size which has the capacity to produce 1 MWh of electrical energy, could generate a ROI of up to 1.6 million euro per year (pretax). This translates into an IRR on investment of more than 30% and a linear payback period of approximately 3.2 years.